Short Bytes: The fastest search engine on the planet has many unique features hidden inside which can enhance your experience. Use these simple Google Search tips and tricks to make your Google search more efficient and save your time. Google Search has the biggest consumer base in the world. 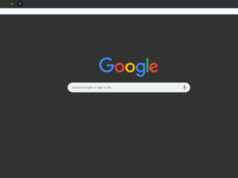 In fact, many people often visit google.com just to check whether their internet connection is working or not. That’s the proof of the popularity that Google deserves after creating a product that is unmatched. Intelligent minds at Google work very hard to come up with complex formulae and algorithms that make the search simpler for you. Behind the scenes of Google Search or any other search engine include crawling websites on the internet and arranging the data in an index. In this article, I have covered various Google Search tricks which you can use to search on Google like a pro. Learn these simple things, and your daily search regime will be like a knife in hot butter. Before trying out these search tricks, make sure that you are logged in to your Google account in the web browser you’re using. Google knows how eagerly you wait for your online deliveries and that’s why they have added package tracking functionality into their search engine. 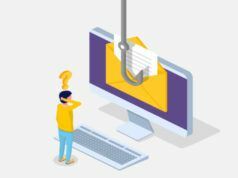 Type “My Packages” or “Where’s my package?” or “Where’s my Amazon package?” and Google will tell you where your package has reached by extracting the tracking number from the confirmation mail in your Gmail inbox. Are you running out of minutes? Use the timer and stopwatch features in Google Search. All you have to do is type “Set a timer for 5 minutes” or simply “timer” in the search box and hit enter. You can configure the time as per your convenience. Type “Stopwatch” for accessing the stopwatch feature. Plan something special for your Mom this weekend, take her out for dinner. You need to create an event to make it memorable. 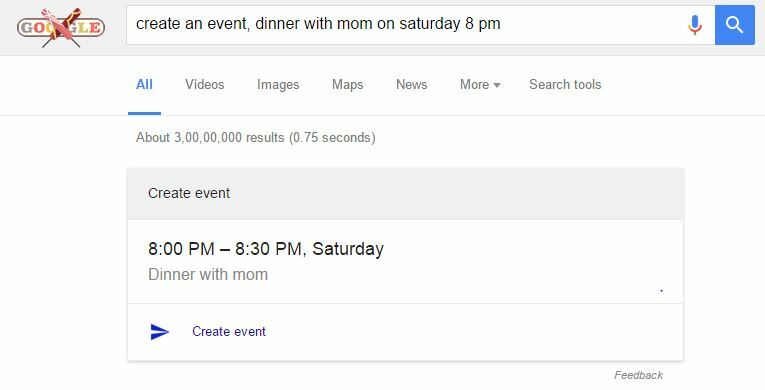 Just type “Create an event, dinner with mom on Saturday 9 pm”. You want to visit a salon or a supermarket, just add a reminder to your Google account by typing in the search box. For instance, you use your free time to visit fossBytes again, just type “Remind me to open fossBytes at 7 pm”. Type “Show me my pictures in the mountains” and Google will display your photos having mountains as background, provided you have uploaded some of them to your Google account (either in Google Photos or Google+). Relevant snaps from Google+ are displayed even if you haven’t tagged yourself. Converting one unit to another is a child’s play on Google search. Be it the volume, weight, currency, etc. the search engine is at your service. For example, “What is 25 cm in inches?” or “Convert $250 to INR”. Track your stock prices directly from the search engine, type “stock GOOGL” or “stock MSFT”. Google will display the share price data along with highs and lows graph in different time spans. I told you about how you can add events to your calendar. 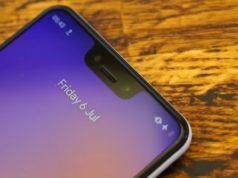 You can also ask Google about natural events like a sunset or some celebration day, like, “When is the Good Friday?” or “When is Tomorrowland?”. If you write something like “When is the sunset?”, Google will display the sunset timing based on your current location. If you have the habit of skipping your breakfast in the morning, well, you can grab a sandwich while commuting to work. Type “Where is the nearest sandwich shop?”. Google search allows you to find local businesses like grocery stores, ice-cream parlors (and much more) around you. Just type “How many calories in an apple” or “Nutritional value of banana”. Google wants to make sure your body gets nourished properly. You can check the nutritional value of various food items. Use this Google search trick view pictures of people and places like the Empire State building or the Bondi Beach. Type “Show me the photos of Pattaya” or “Show me the pictures of Brangelina”. “When was Peter Dinklage born?” or “How old is Luis Suarez?”. Know about the lives of celebrities and famous personalities like Albert Einstein. Google usually sources information from Wikipedia to answer queries regarding birth, age, career, etc. You can ask Google for customer care numbers and service center addresses. For example, “What is Sony’s Customer Care Number?” or “Samsung service locations in New York”. Are you planning to visit some new city in a day or two? Check the weather conditions in advance, so you don’t have to deal with difficulties during your trip. Type “weather” followed by the name of the place like “Weather London”. You can know whether it’ll rain today or not, type “Do I need a raincoat today?”. Type “time” to know at what number the clock is ticking at your location. To know the time of another place, enter the name of the place after “time” in the search box. For example: “What time is it in Mumbai?”. Experience the heat of the playground right on the screen in front of you. Type “La Liga Fixtures” or “Did West Indies win last night?”. You can also know about live scores when a game is in progress. How much tip should you give? Giving tips is a standard ritual for us at restaurants and hotels. But sometimes we can’t figure out how much tip we should pay, or in case, someone is giving a tip for the first time. Some people give large tips at luxury fine dining restaurants to show their status symbol. But you can’t shell out a 50 dollar tip for a 100 dollar bill. Google search also has an inbuilt Tip calculator, so that you don’t flow in your emotions and empty your pocket in front of the waiter. Just type “What’s the tip for 100 dollars?” in Google Search. Burnt your brain circuits while solving math problems? All complex questions will be like a no-brainer with the help of the search engine’s calculator tool. It is not just the cube roots and square roots, you can solve questions involving sin, cos, tan functions as it is a scientific calculator. Like “What is the cube root of 375?”. You can actually write complex formula like “0.67 + 56*64 – pi +(sqrt(e^6)/756))”. Have a buttery smooth conversation with your international friends by including words and phrases from their language. Type “How to say hello in Spanish?”. 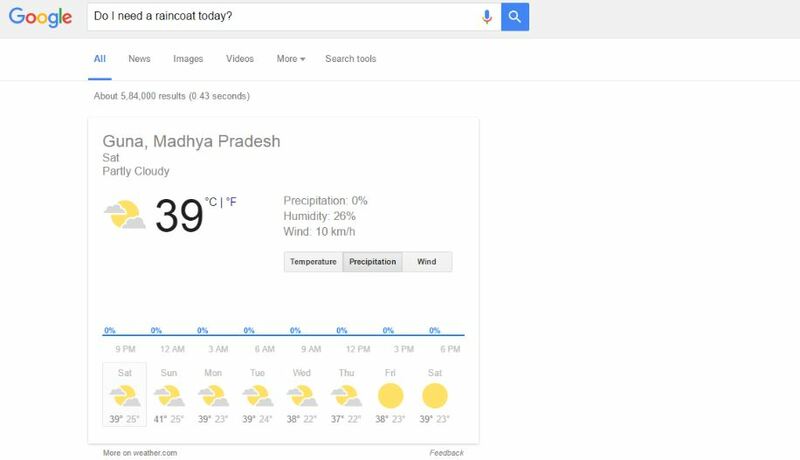 Use the capabilities of Google translator right in your Google search box. You can use this feature to give directions to a local taxi driver in another country who may not be able to understand your language. You can see the list of songs sung by a particular artist or a band. Type “What does Myles Kennedy sing?” or “Best songs of Linkin Park.” Google Search mentioned the album and release year for each song that comes up on the list. Clicking a song name displays more information about the song and a YouTube video link, if available. Search for local movie showtimes. Type “What movies are playing in cinemas” or ” Movie Near Me,” and Google will display the list of movies theaters in your area. Click a movie to know more about its timings and location of the movie theater. You can also type “Superhero movies in 2017”, but if you type “Superhero movies to be released in 2017” it will only display those movies which haven’t been released in the year 2017. 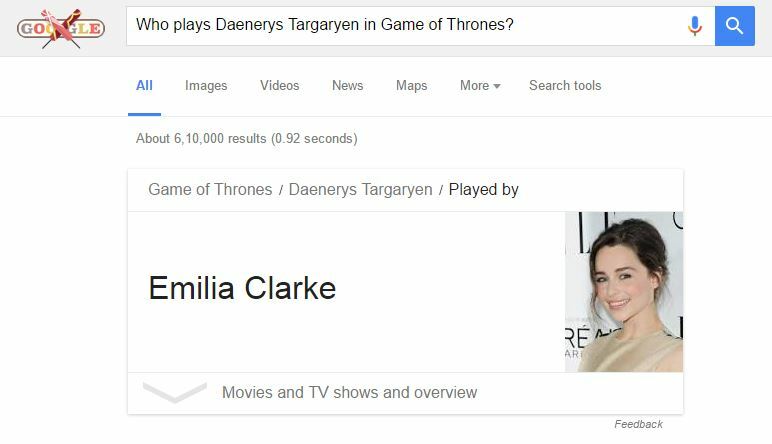 Can’t remember the real name of Khaleesi in GOT, Google it — “Who plays Daenerys Targaryen in Game of Thrones?”. You can search a lot of trivia facts like TV show casts, director names, et cetera. And do remember to pay more attention to the credits in Season 7. You can search it on Google, anyways. You can use turn-by-turn navigation functionality right from the search. Type “Take me to home” and it will starting helping you with the directions to your home by knowing your address saved in Google Maps. A little knowledge about the new place you’re visiting adds to your convenience during the trip. Type “What are the popular attractions in London?”. Utilize your holidays to improve your general knowledge. Use Google Search to know about historic buildings and places or explore the modern world. For example, just type “Where is Madison Square Garden?”. The 19-year old search engine handles around 3 billion search requests in a day, and still, it has time to listen to every individual user’s needs. 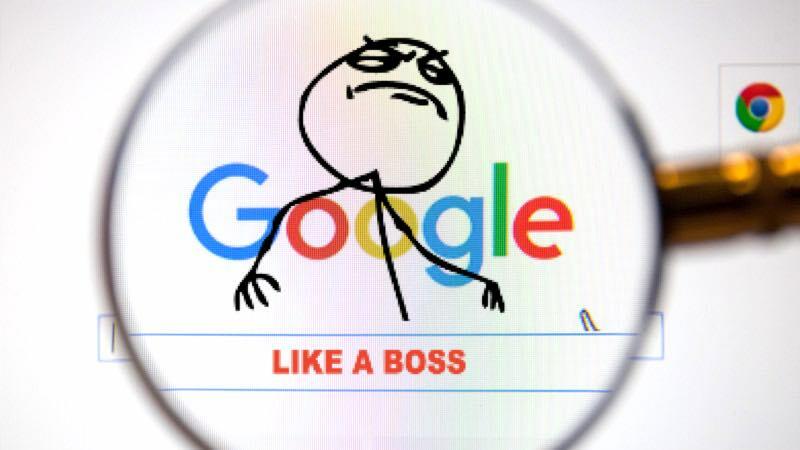 These simple google search tricks will help you find relevant content easily and help you search like a boss. In a nutshell, Google has combined its various products with the search engine, otherwise, you would have to individually access the translator, maps, Gmail other features. What Does The I’m Feeling Lucky Button On Google Search Do?